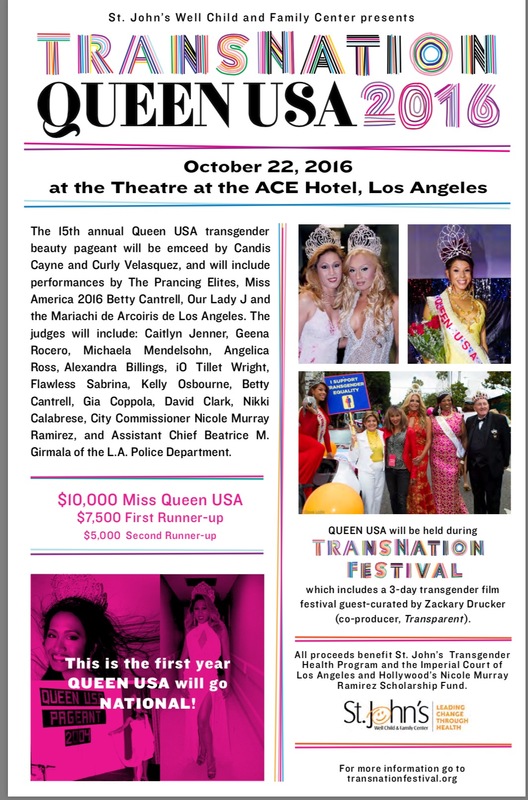 October 20th 2016 marks the official induction of the 1st Annual Trans Nation Festival, co-hosted by Amazon Prime. This 4 day celebration runs October 20th -23rd 2016, and will pay tribute to the trans community through beauty, art, and film. The event will be initiated with a film festival guest curated by producer and trans performance artist Zackary Drucker. An eclectic selection of the best new shorts along with rare gems that reflect the trans experience through film are expected to be showcased in the city of West Hollywood. Filmmakers and actors will present these pieces, which will also include the Los Angeles premiere of "Diane from the Moon", starring Mya Taylor. Candis Cayne and Curly Velasquez will emcee The Queen USA Transgender Beauty Pageant, which is also constituted in the 4 day festival. This 15 year long pageant was created to celebrate the heights of transgender beauty culture while engaging contestants and the audience in a broader awareness of transgender issues. The assortment of celebrity judges will include Caitlyn Jenner, Geena Rocero, Alexandra Billings, and Kelly Osbourne to name a few. Contestants will compete in the categories of swimsuit, cocktail, and evening wear in addition to participating in a q&a portion which will enable contestants to explore key issues facing the transgender community. Proceeds from the 4 day festival will go to the Imperial Court of Los Angeles, which is a private non profit 501(3) California Public Benefit corporation whose primary goal is to further relationships with organizations and businesses within the LGBT community in Los Angeles. Donations will also benefit St. John's Well Child and Family Center, an independent non profit 501(3) community health center that provides primary health care along with socioeconomic and social justice services for over 1200 transgender patients in South LA. St. John's has been a groundbreaking addition for the transgender community of Los Angeles in terms of health care. "Our clinic has grown from 6 patients to over a thousand in less than 3 years with virtually no outreach or promotional work. Our program has grown exponentially through word of mouth," says Diana Feliz Olivia, Program Director of St. John's Transgender Health Care Program. "The reason for the Trans Nation festival is to bring trans men and women together to build community and support. We really needed a multi-day festival in Los Angeles to celebrate the intelligence, grace, poise, and talent of the trans community while raising funds to expand our services and create new opportunities for our community." Diana Olivia has been the program director of the St. John's Transgender Health Care Program for over a year, and emphasizes how the health care program is unique in the way it serves the trans community. "The majority of our staff is transgender, which immediately puts our new and present patients at ease. They walk into our office and they see someone who looks like them, talks like them, and dresses like them and they feel comfortable. This is part of what has made our program so successful and unique." The Trans Nation Festival is the first of its kind in Los Angeles and many in the trans community are hoping this event will not only bring the community closer together, but also help other communities familiarize themselves with what being trans means. 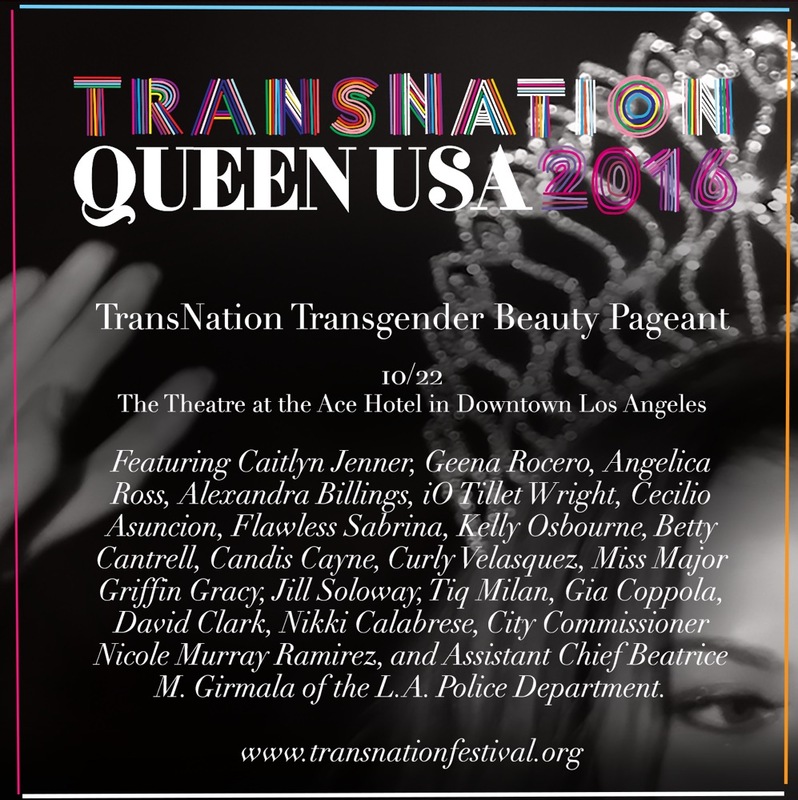 The Trans Nation festival is particularly different from the San Francisco Transgender Film Festival, because there is an entire day specifically set aside to celebrate the beauty of being transgender though the Queen USA Transgender Beauty Pageant. This is particularly important, because many trans men and women struggle with the idea of feeling or being beautiful, since society teaches us we are not. It is vital to continue to maintain and cultivate transgender health care services because there are very few places where transgender health care is offered in an affordable and personalized setting. The Affordable Care Act included trans health care in many places and that was a remarkable step in the right direction for trans people, but in some ways it still remained difficult to receive personalized and comprehensive transgender healthcare. Now that health care is available it is wonderful to see community leaders, celebrities, and city officials coming together for one cause: to maintain the health and happiness of the transgender community in Los Angeles.